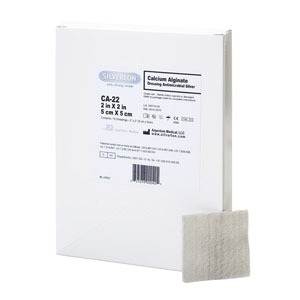 Advanced Antimicrobial Calcium Alginate Dressing, is a sterile, nonwoven pad composed of a High M (manuronic acid) alginate and a silver nylon contact layer. The silver ions provide an antimicrobial barrier which protects the dressing from bacterial contamination, including MRSA Bacteria. The dressing absorbs exudates, maintains a moist wound environment and allows for intact removal. Provides extra absorbency and exudate management. Provides up to 7 days of antimicrobial protection. The durable mesh core ensures the dressing's high integrity, tensile strength.